As Team Tiger prepares for the upcoming season, the club has asked me to give a running account of the season in the newsletter. 2018 will mark the thirty-eighth year that we have raced the Tiger. It started with a chance invite to attend an “autocross” competition in the 70’s. I had a V-6 74 Capri and I quickly became addicted to racing thru the cones. The adrenaline rush was amazing. The same person that turned me onto this new form of motorsports also had a car for sale, and I was looking for a project. He had a small roadster with a Ford V-8 called a Sunbeam Tiger. I was a fan of Get Smart. Although I never saw the car as a performance car, but I thought it would be a great autocross car. I purchased the car and boxes of parts for $1,000. I later found that the car was a 1967 Mark 2–blind luck of course. The Tiger and I were at an autocross just about every week. I quickly met people who had owned or knew someone who had owned a Sunbeam and, instantly, we had a connection and bond. In my quest for faster times, I would work on the car to make it more responsive and fun. Eventually I bolted a set of 13” slicks, added a rear sway bar and larger front and started towing the car to the events. The car was an absolute rocket ship and with the slicks it stuck like a go cart. Like any addiction, I decided I needed more and I purchased another Mark 2 in 1977. While rebuilding that Tiger, another one came up for sale: this one a late Mark 1. I thought it would make the perfect car to go SCCA road racing. The racing class for the Tiger at the time was C production, which was dominated by the Datsun Z, Mazda RX7 and Porsche 914 6. SCCA rules back then allowed very few changes from stock. So the Tiger first raced in C/P in April 1980. The body was completely stock except for steel flares to cover the 20” tall racing slicks on 7” wide wheels. The body had been dipped and the body seams were all welded to add rigidity. A roll cage was fabricated per the rules and a racing seat with a 6-point harness added. Except for the flares the car was similar to the vintage race Tigers you see today. In 1984, C/P was merged into GT2 (Grand Touring) and the resulting rule changes were very beneficial to the Tiger. By the early 90s, the class performance bench mark was based on 400 horsepower (at crank) and 2280 lbs. of weight for car and driver. So the various cars were either restricted in power, or weight was taken off or added. 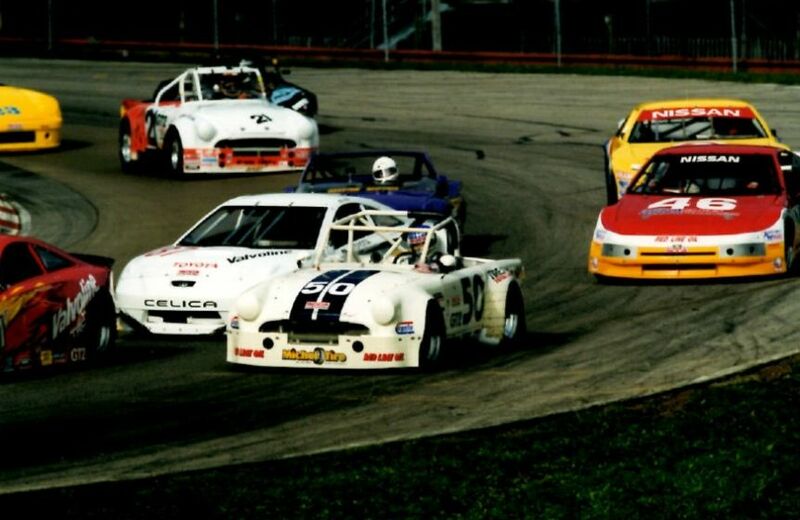 We became very competitive in the 90’s with our first SCCA Runoffs podium in 1993, Runner up in 1998 and finally our biggest feat the GT2 National Championship in 1999 at Mid Ohio. 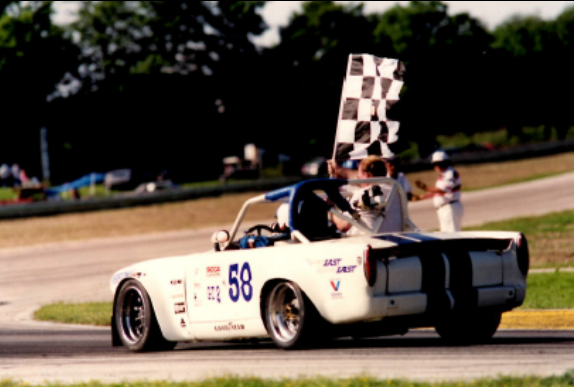 We did follow that up in 2011 with a strong second at Road America. After the win in 1999, we received several restrictions in performance, the worst being a restrictor plate in 2002 (finally removed in 2013). That made the second place in 2011 very satisfying. The Tiger had been very competitive thru this time setting track records at most of the SCCA Central Division tracks plus St. Louis Gateway and Road Atlanta. However, the class was under subscribed, the cars I was competing against were very expensive and the top runners were getting manufacturer’s assistance. Consequently, some races had only two or three GT2 cars. And that is not fun. In 2013, SCCA started the SCCA Majors with an emphasis on bigger fields and stronger competition. The club saw a way to fix the class and put the former STO class into GT2. They also added the pro World Challenge and Trans Am’s TA2 cars into the class. We quickly found that we were no match in performance against the Vipers, Corvettes, Masseratis, Porsche 997, TA2 Mustangs and Camaros. To the credit of SCCA, they realized that the former GT2 cars needed help and that 400HP bench mark needed to be around 475HP. After the 2013 season the club allowed the Tiger to finally get some real racing parts. They allowed the Edelbrock SCCA A sedan head instead of the original cast iron Ford heads. Around the same time, I switched from Goodyear racing tires to Hoosier. 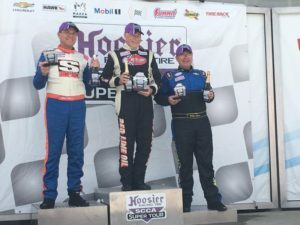 In 2014 it all came together at Mid Ohio as Hoosier had worked very hard with me to improve their 16” radial racing slicks; we started setting track records and winning races again. We currently hold the GT2 track records at Road Atlanta, Watkins Glen, Grattan, Nelson Ledges and Gingerman. What makes it even better is that now we are having larger fields at the races. It is normal to have more than ten GT2 cars in a race and sometimes many more. At last year’s SCCA Runoffs at Indianapolis Motor Speedway there 36 GT2 cars in the race. That brings you up to the present as we prepare the car for our first race in 2018. I have been asked what I do to get ready. After the Runoffs in late September, the car was stripped back down to the bare chassis. Every component was checked and if it needed repair or replacement it was done. This time we found that the new transmission had a dog ring break so it was shipped back to the manufacturer. I had asked SCCA for the ability to use a roller cam which up until this year was not permitted. So the backup motor was taken to the engine shop. The heads and intake were removed and sent out for flow work. The new cam and associated parts are being gathered and that engine should be ready late March. When it is ready, we will use the chassis dyno to tune the new package. New aero dynamic rules were announced in February and we are studying how that might impact the Tiger. I did take a break in late October. My wife Janet and I flew out to Sonoma CA where I rented a Miata race car and ran a test day at Sonoma Speedway, site of the 2018 SCCA Runoffs. I also started racing online with Iracing this past summer. I have found that the realism allows me to learn new tracks faster and to improve my lap times on all our tracks. An added bonus is that it gets me out of the garage a few hours a day and it is a blast. We are three weeks away from the first race in 2018 at NOLA in New Orleans. We are in the final stages of preparations. The car is all back together after every bolt and part has been inspected (or replaced) and ready to be scaled and aligned. You may have noticed that I often use the term “we” when referring to the race car. The reason is that it takes many people to put this program together. I can do only so much (I am very aware of my limitations). I have a great support group that I can lean on for advice and sometimes require their special skill sets to keep us on the track. Paul’s Automotive and Engineering in Blue Ash, Ohio is a great example. Paul and his team build the motors and help develop packages that work as the rules change. Also, they are there when there is a special need. Doran Racing is another major supporter, as this is where the chassis goes when there is an on-track incident and none of the wheels are pointed in the right direction. Kevin will stick the chassis on a surface plate and bring it back from the grave using our initial set of blue prints. Kevin made jigs of our spindles and control arms so replacements can be made quickly. 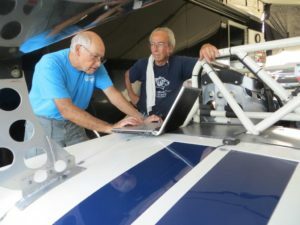 For 38 years Bill at Performance Alignment has helped make a race car that had a reputation for poor handling into one that amazes the competition. Doug Jennings has been one of those very important people with a wealth of information and the desire to help. Doug is always up to the task whether it is making new body molds or helping to dismantle a wrecked race car. I will spend typically 10 hours of preparation for every hour of track time, but it is worth it and I enjoy it. At the start of this article I spoke of the adrenaline rush, all this effort and sacrifice is worth it once the Tiger gets unleashed on the race track! Thanks for the Briefing on the “TEAMs” efforts to keep the Tiger on the track….enjoyed the read!